We have changed our arrangements for bed linen in the apartments. We are now offering 2 options to choose from when booking your next family holiday. For a one-off charge of just £5 for each single bed and £8 per double bed when you pre-purchase alongside booking your holiday and they’re yours to keep*. 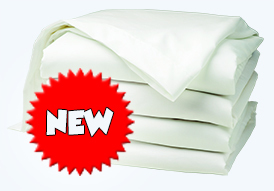 Do you prefer to bring your own bed linen? Not a problem, simply bring your own and make your apartment feel like home. Purchase a linen pack when you book and save. Linen packs purchased on park will cost £10 per single bed and £20 per double bed (subject to availability) please pre-purchase your linen if required to guarantee outstanding value for money. Ensure you book your linen at the time of booking your holiday to receive the pre-book discount price. Please note: towels are not provided in the apartments, but are available for purchase on park if you forget your own.